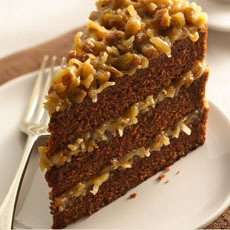 German chocolate cake—named after Sam German, not Germany—is chocolate layer cake with a rich coconut and pecan filling and topping. Photo © H.D. Connelly | Fotolia. 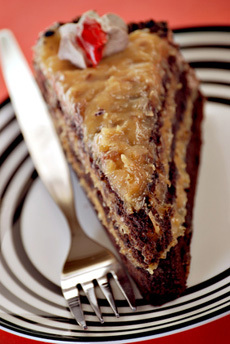 June 11th is National German Chocolate Cake Day (see all the food holidays). German chocolate cake is a chocolate layer cake with a rich coconut pecan and coconut filling and a chocolate frosting, topped with more coconut. German chocolate cake does not come from Germany or from German immigrants. Rather, it is made with a product called German chocolate, a milder, sweeter baking chocolate created in 1852 by Sam German, an Englishman who worked in the U.S. for Walter Baker & Company. (Milk chocolate would not be invented until 1876, by Daniel Peter in Vevey, Switzerland). According to Kraft Foods, which now owns Walter Baker & Company, German chocolate cake was originally called Baker’s German’s Sweet Chocolate. The apostrophe-“s” was later dropped, adding to the confusion with Germany. The popular recipe for German Chocolate Cake was submitted to a Dallas newspaper almost 100 years later, in 1957, by a Texas housewife who may or may not have invented it. 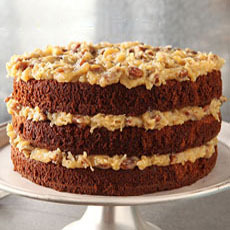 In light of the resulting demand for German chocolate, General Foods (since merged with Kraft) sent the recipe to newspapers nationwide, and the cake became a national hit. Note that numerous recipes can be found that are called “German Chocolate Cake,” but contain none of the differentiating ingredients. A German cake must include a filling/topping of coconut and pecans. Optional garnish: 15-20 candied pecan halves to garnish rim of cake. The original German Chocolate Cake had no frosting on the sides, like this recipe. Over time, a hard chocolate icing was added by some bakers. The frosting and filling are so rich, that we prefer the original. Top photo courtesy Betty Crocker, bottom photo courtesy Kraft. Place rack in center of oven; preheat oven to 350°F. Butter pans, line with parchment paper and dust with flour. In a clean bowl, sift together the flour, cocoa powder, baking powder, baking soda, and salt. Set aside. In a small bowl, combine the coffee and buttermilk. In the bowl of a stand mixer, or in a separate bowl with a hand mixer, beat the butter until smooth and creamy. Add the sugar and continue beating until the mixture is fluffy, 3-5 minutes. Scrape down the sides of the bowl; then add the eggs, one at a time, mixing well after each and scraping down the sides of the bowl as needed. Add the vanilla extract and blend. Now beat in the flour mixture and the coffee/buttermilk mixture, beginning with half the flour mixture, then the entire coffee/buttermilk mixture, then the remainder of the flour mixture. Divide the batter evenly among the three pans; smooth the tops. Bake for 30 to 35 minutes or until a toothpick inserted in the center comes out clean and the tops spring back when lightly pressed. Remove from oven and place on a wire rack to cool (about 20 minutes). Invert the layers onto a wire rack sprayed with vegetable spray (or buttered lightly). Cool the cakes completely. Toast the pecans: Preheat the oven to 350°F. Place pecans on a baking sheet and bake for 8 to 10 minutes or until lightly browned. Remove from oven, cool, then coarsely chop. Set aside. In a medium saucepan, combine the sugar, milk, egg yolks, butter, and salt. Cook over medium heat, stirring constantly. When mixture begins to boil and thicken, remove from heat. Stir in the chopped pecans, coconut and vanilla extract. Let cool until spreadable. Place the first cake layer on the serving plate and cover with 1/3 of the frosting. Repeat with second and third layer. The cake can be made up to two days in advance and stored at room temperature.